After the record-breaking and fatal flu season of 2014-2015, the Division of Public Health is hosting multiple statewide free flu shot clinics. Delaware Health officials distributed free flu shots Friday to Delaware residents 9 and older at the New Castle Farmer’s Market. The Division of Public Health wants to make sure this flu season isn’t a repeat of last year’s. There were 2300 reported flu cases during the 2014-2015 flu season, and 28 reported flu-related deaths. An unexpected mutation of one strain put a challenge on combating the flu last year, said Dr. Karyl Rattay, Director of Public Health for Delaware Health and Social Services. Dr. Ratty added that this year’s flu vaccine looks like it’s a great match for that strain. It is especially important for those considered high risk to get immunized. People exposed to a high risk of getting the flu include: older people, the very young, and those with underlying medical conditions. 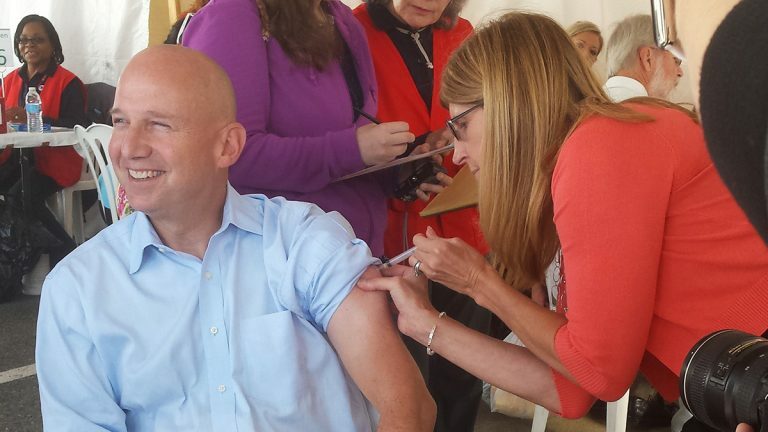 Among the many residents who rolled up their sleeves to get a free flu shot, was Governor Jack Markell. “The flu vaccine protects you and your family, co-workers, and others,” Markell said. The New Castle Farmer’s Market free flu clinic is one of the 36 clinics that will be held statewide from October through December by the DPH. The Farmer’s Market clinic runs until 3pm today. For information on other Public Health vaccination clinic dates, call the Delaware Immunization Hotline at 800-282-8672 or visit the website www.flu.delaware.gov.